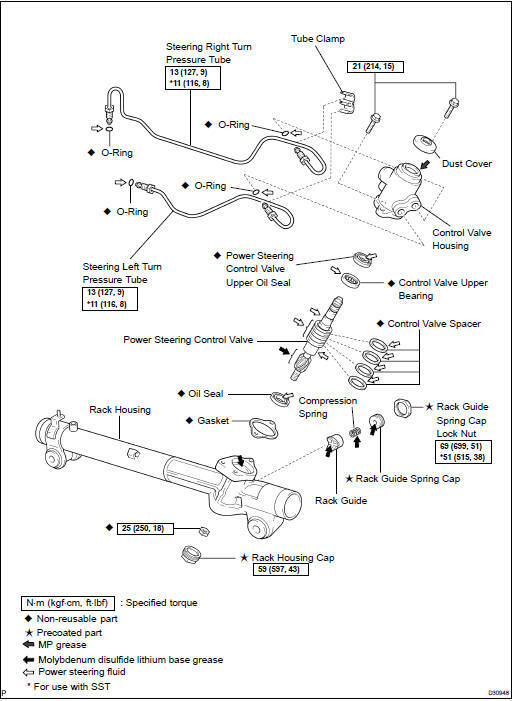 NOTICE: When installing ,coat the parts indicated by arrows with power steering fluid or molybdenum disulfide lithium base grease (see page 51-25 ). HINT: Perform the same procedure as for the LH. (a) Fix the steering wheel with the seat belt in order to prevent rotation. HINT: This operation is useful to prevent damage to the spiral cable. (b) Loosen bolt A and remove the clamp from the steering column hole cover No.1. (c) Separate the steering column hole cover No.2 from the steering column hole cover No.1. (e) Put matchmarks on the steering intermediate shaft subassy and the steering link assy. (f) Remove the bolt and disengage the steering intermediate shaft sub-assy. (a) Remove the 2 bolts, the stabilizer bracket No.1 LH and the stabilizer bracket No.2. (b) Remove the stabilizer bar bush No.1 from the stabilizer bar. (a) Remove the tube clamp from the pressure feed tube assy. (b) Using SST, disconnect the return tube assy from the steering link assy. (c) Remove the nut and the return tube clamp. (a) Using SST, disconnect the pressure feed tube assy from the steering link assy. (b) Remove the bolt and the pressure feed tube clamp. (a) Remove the 2 bolts, the nuts and the steering link assy. (a) Remove the tube clamp from the turn pressure tubes. (b) Using SST, disconnect the left turn pressure tube. (c) Remove the 2 O-rings from the left turn pressure tube. HINT: Perform the same procedure as for the left turn pressure tube. (a) Using SST, secure the steering link assy. 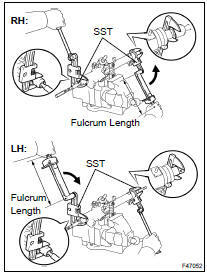 HINT: Wrap the SST with tape before use, in order to prevent damaging the steering link assy. (a) Put matchmarks on the tie rod assy LH and the rack end. (b) Loosen the lock nut and remove the tie rod assy LH and the lock nut. (a) Remove the 2 boot clips. (a) Using pliers, remove the rack boot No.2 clamp. NOTICE: Be careful not to damage the boot. HINT: Perform the same procedure as for the No.2 clamp. (a) Using a screwdriver and a hammer, unstake the claw washer. NOTICE: Avoid any impact to the steering rack. (b) Using 2 SST, remove the rack end RH and the claw washer. NOTICE: Use SST 09922-10010, following the direction shown in the illustration. (c) Using 2 SST, hold the steering rack and remove the rack end LH and the claw washer. (a) Using SST, remove the spring cap lock nut. (b) Using SST, remove the rack guide spring cap. (c) Remove the compression spring and the rack guide. (a) Using a socket wrench (27 mm), remove the rack housing cap. (b) Using SST, keep the control valve shaft and remove the nut. (c) Wrap vinyl tape around the spline of the control valve in order to prevent damaging the oil seal. (e) Remove the 2 bolts and the control valve housing with the control valve. (g) Using a plastic hammer, remove the control valve. (h) Remove the oil seal from the control valve. (i) Using a screwdriver, remove the 4 control valve spacers. NOTICE: Be careful not to damage the spacer grooves. (a) Using SST and a press, remove the control valve upper bearing and the upper oil seal from the control valve housing. (a) Using a screwdriver and a hammer, turn the cylinder end stopper clockwise until the wire end is visible through the service hole. (b) Using a screwdriver and a hammer, turn the cylinder end stopper counterclockwise, and remove the wire and the cylinder end stopper. (a) Remove the rack bush with the rack bush oil seal from the power steering rack. (b) Using SST, remove the rack bush oil seal from the rack bush. NOTICE: Be careful not to drop the rack bush. (c) Using a screwdriver, remove the O-ring from the rack bush. (a) Using a dial gauge, check for runout of the steering rack and teeth wear. NOTICE: Make sure that the steering rack is placed holizontally. (b) Check the rack surface for wear and damage. 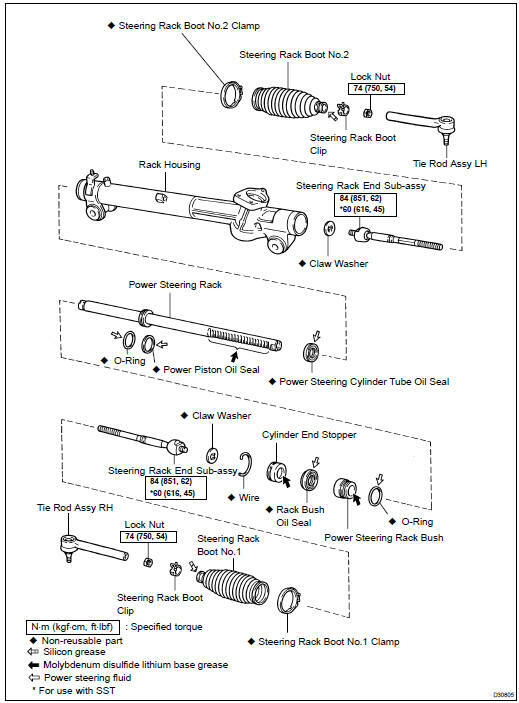 If runout exceeds maximum, replace the power steering link assy. (a) Using SST and a press, remove the cylinder tube oil seal. NOTICE: Be careful not to damage the inside surface of the rack housing. (a) Using a screwdriver, remove the oil seal and the O-ring. NOTICE: Be careful not to damage the oil seal groove. (a) Coat a new O-ring with power steering fluid and install it to the steering rack. (b) Expand the new oil seal with your fingers. NOTICE: Be careful not to overly expand the oil seal. (c) Coat the oil seal with power steering fluid. (d) Install the oil seal to the steering rack, and adjust with your fingers. (a) Coat a new oil seal lip with power steering fluid. (b) Using SST and a press, install the oil seal. NOTICE: Make sure that the oil seal is installed in the correct direction. (a) Secure the tie rod assy LH in a vise. (b) Install the nut to the stud bolt. (c) Flip the ball joint stud back and forth 5 times. (d) Using a torx) wrench, turn the nut continuously at a rate of 2 to 4 seconds per turn and take the torque reading on the 5th turn. Turning torque: 0.49 to 3.43 NVm (5.0 to 35.0 kgfVcm, 4.3 to 30.4 in.Vlbf) If not within the specified torque, replace the tie rod assy LH. (a) Apply grease to the rack teeth ends. (b) Affix SST to the steering rack. HINT: If necessary, scrape the burrs off the rack teeth ends and burnish. (c) Coat SST with power steering fluid. (d) Install the steering rack to the rack housing. (a) Coat a new rack bush oil seal lip with power steering fluid. (b) Using SST and a press, install the rack bush oil seal to the rack bush. (c) Coat a new O-ring with power steering fluid and install it to the rack bush. (d) Coat the rack bush oil seal lip with power steering fluid. (e) Install the rack bush to the rack housing. HINT: Wrap vinyl tape around the end of the steering rack in order to prevent damaging the rack bush oil seal. (a) Align the installation hole for the wire of the cylinder end stopper with the slot of the rack housing. (b) Install a new wire into the cylinder end stopper. 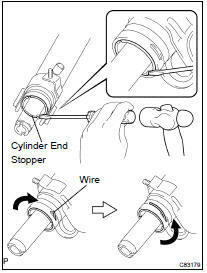 (c) Using a screwdriver, turn the cylinder end stopper counterclockwise by 450 50 . (a) Install SST to the rack housing. (b) Apply a vacuum of 53 kPa (398 mmHg, 15.65 in.Hg) for about 30 seconds. (c) Check that there is no change in the vacuum pressure. If there is a change in the vacuum pressure, check the installation of the oil seals. (a) Coat the control valve upper bearing with grease, and a new control valve upper oil seal lip with power steering fluid. (b) Using SST and a press, install a new control valve upper oil seal. (c) Using SST and a press, install the control valve upper bearing. (a) Expand 4 new valve spacers with your fingers. NOTICE: Be careful not to overly expand the valve spacers. (b) Coat the 4 valve spacers with power steering fluid. (c) Install the 4 valve spacers to the control valve, and adjust with your fingers. (d) Carefully slide the tapered end of SST over the valve spacers until they fit to the control valve. NOTICE: Be careful not to damage the valve spacers. (e) Coat the oil seal lip with power steering fluid. (f) Install the control valve into the valve housing. NOTICE: Be careful not to damage the valve spacer and oil seal lip. HINT: Wrap vinyl tape around the end of the steering rack in order to prevent damaging the oil seal. (g) Coat a new oil seal lip with power steering fluid. (h) Using SST and a press, install the oil seal. (i) Apply grease to the needle roller bearing of the rack housing and the serrated part of the control valve. (j) Install a new gasket to the valve housing. (k) Install the control valve housing with the control valve to the rack housing with the 2 bolts. HINT: Wrap vinyl tape around the lower spline of the control valve in order to prevent damaging the oil seal. (l) Using SST, keep the control valve from rotating and install a new lock nut. (m) Apply sealant to 2 or 3 threads of the rack housing cap. (n) Using a socket wrench (27 mm), install the rack housing cap. (o) Using a punch and a hammer, stake the rack housing cap and the rack housing. (a) Apply grease to the compression spring and the contact surface of the rack guide. (b) Install the rack guide and the compression spring. (c) Apply sealant to 2 or 3 threads of the rack guide spring cap. (d) Temporarily install the rack guide spring cap. (a) Temporarily install the RH and LH rack ends sub-assy, in order to prevent the oil seal from being damaged by the rack teeth. (b) Using SST, torque the rack guide spring cap. (c) Using SST, loosen the rack guide spring cap. (d) Using SST, turn the control valve to right and left 1 or 2 times. 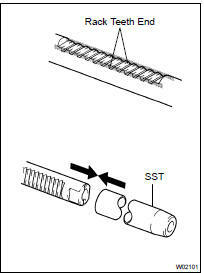 (e) Using SST, loosen the rack guide spring cap until the compression spring stops functioning. (f) Using SST and a torque wrench, tighten the rack guide spring cap until the preload falls within specifications. (g) Apply sealant to 2 or 3 threads of the rack guide spring cap lock nut. (h) Temporarily install the rack guide spring cap lock nut. (i) Using SST, hold the rack guide spring cap and using another SST, torque the spring cap lock nut. HINT: Use a torque wrench with a fulcrum length of 345 mm (13.58 in.). (j) Precheck the total preload. (k) Remove the RH and LH rack ends sub-assy. (l) Apply MP grease around the control valve shaft, as shown in the illustration. (m) Wrap vinyl tape around the spline of the control valve. (n) Install the dust cover to the control valve housing. (a) Install 2 new claw washers, and temporarily install the 2 rack ends sub-assy. HINT: Align the claws of the claw washer with the steering rack grooves. (b) Using SST, install the 2 rack end sub-assy. Using SST, hold the rack and install the rack end subassy. (c) Using a brass bar and a hammer, stake the 2 claw washers. (a) Ensure that the holes of the rack ends are not clogged with grease. HINT: If the hole is clogged, the pressure inside the boot will change after it is assembled and steering wheel is turned. 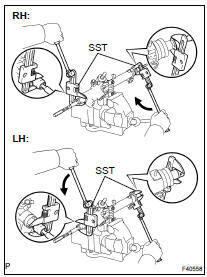 (a) Using SST, tighten the rack boot No.2 clamp, as shown in the illustration. (a) Using pliers, install the 2 boot clips. (a) Screw the lock nut and tie rod assy LH on the rack end until the matchmarks are aligned. HINT: After adjusting toe-in, torque the lock nut (see page 26-7 ). (a) Coat 2 new O-rings with power steering fluid and install them to the left turn pressure tube. 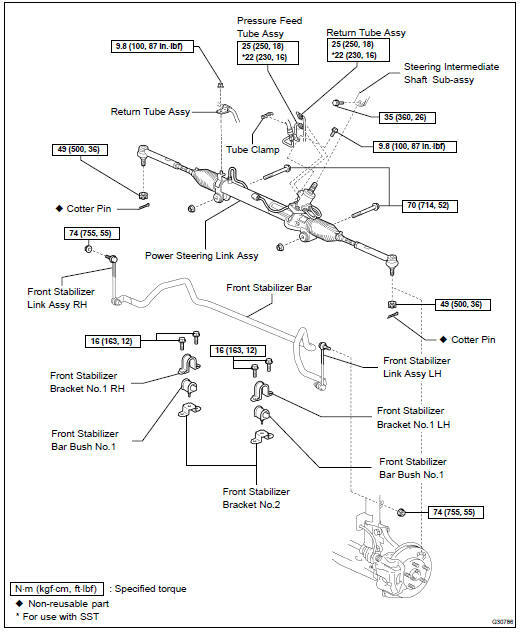 (b) Using SST, install the left turn pressure tube to the steering link assy. Use a torque wrench with a fulcrum length of 300 mm (9.84 in.). (a) Perform the same procedure as for the left turn pressure tube. (b) Install the tube clamp to the turn pressure tubes. (a) Install the power steering link assy with the 2 bolts and the nuts. (a) Using SST, connect the pressure feed tube assy to the steering link assy. Use a torque wrench with a fulcrum length of 300 mm (11.81 in.). (b) Install the pressure feed tube assy clamp with the bolt. (a) Using SST, connect the return tube assy to the steering link assy. (b) Install the tube clamp to the pressure feed tube assy. (c) Install the return tube clamp with the nut. (a) Install the stabilizer bar bush No.1 to the stabilizer bar. (b) Install the stabilizer bracket No.1 LH and the stabilizer bracket No.2 with the 2 bolts. (a) Align the matchmarks on the intermediate shaft sub-assy and the steering link assy. (d) Install the steering column hole cover No.2 to the steering hole cover No.1.